I have done most of my Adirondack hiking in the eastern half of the Adirondack Park, but I'm slowly doing the westward expansion to incorporate other areas new to me. Such was the case today. My dog Rev and I ventured to the Town of Inlet and into the Pigeon Lake Wilderness to explore the area around Queer Lake. 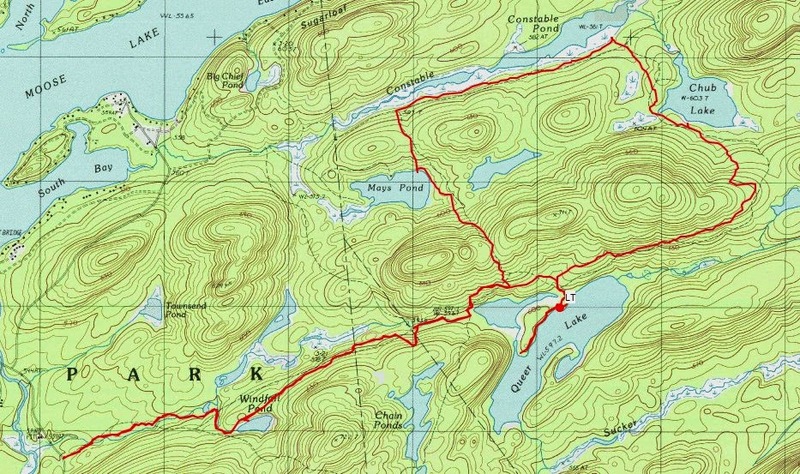 To get to the trailhead, I traveled west past Inlet on Route 28, to Eagle Bay, where I took Big Moose Pond Road north to the Windfall Pond parking lot. As I passed parking lots for Moss Pond and Cascade Lake, there were quite a few cars in each, but when I got to the Windfall Parking lot, it was empty. That was OK with Rev and I. We had a late (11:15) start. My plan was to hike to the Queer Pond leanto and then decide at that point where to go from there. I started out and found the trail to be in quite level in the beginning with only moderate ups and downs later. All the trails I was on were well maintained but have only been lightly traveled (a perfect combination). It was obvious that a trail crew or trail maintainer had recently been through the area. There was some mud in spots due to recent rains, but nothing too bad. At a trail junction at the 2.3 mile mark, the terrain got a little rougher as the trail skirted around the north side of Queer Lake. Soon I was on the peninsula that juts into the lake from the north side. The leanto is near the northern end of the peninsula and is situated close to the water. Extra amenities include a fire ring, log bench and even a picnic table! The leanto is in excellent condition. Rev and I stopped here to have lunch. I pulled out my map to decide what to see next. It had taken us 1 hour and 20 minutes to travel the 3.8 miles to the leanto. First we wandered south along a herd path to the southern end of the peninsula. The peninsula is larger than I had imagined and is almost too big to feel like a peninsula. Next I decided to continue on the trail to Chub Pond and then loop to Constable Pond, over to May Pond and then back out on the trail to the Windfall parking lot. There were quite a few nice new bog bridges along the route. We completed the loop and returned to the car without seeing a single person all day. I signed out at the register and noted that a couple had signed in heading to the leanto for 2 days. They must have made it to the leanto while I was circling the loop. All in all a nice trip with lots of ponds and lakes to look at and a leanto for a place to take a break. I love hiking in this area. That trailhead is always quiet with Cascade and Moss snagging 90% of the tourist trade. I hope to one day do a through hike over West Mountain to Browns Tract Road. Lots of good bushwhacking in the PLWA as well. Hi Chris. I agree that the area looks like it would be pleasant for bushwhacking. I'll be doing more hikes in this direction. There is so much to explore. Did that trail in October 2015 was a very nice trail and i didn't see a person all weekend. Tried fishing Pigeon Lake, Chub and Constable Ponds but didn't get a nibble all weekend. Very nice secluded area, though the trail gets hard to follow as you head east to Pigeon Lake and West Mountain. Joe, I haven't been back there yet to do more exploration, but I plan to this summer. Going there in a few weeks to spend three mid-week nights at Queer. Thanks for the pictures and info - very helpful. Have a great trip! It will probably be quiet mid-week.